Gain regular briefings on the latest thinking and strategies for successful intellectual property litigation and enforcement. 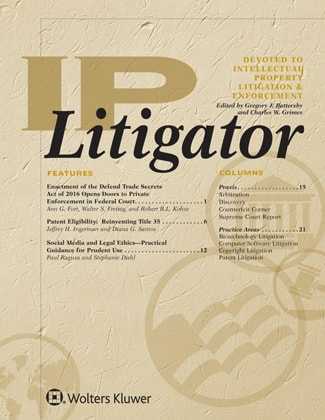 Each issue supplies valuable guidance and practice tips from top litigators and industry experts in patent, copyright, ITC and customs, trademark, and international litigation. From policing the market for infringers...to conducting discovery...selecting expert witnesses...or calculating damages...you'll discover the proven methods winning today's IP cases. With the IP Litigator, you stay fully informed of the key issues you must consider in the new and unfamiliar landscape of intellectual property law.